The latest poster for the Sam Raimi directed re-imagined prequel to The Wizard of Oz, is one of three that will come out in the next few days. But considering it features the Wicked Witch of the West, this may be my favorite. I suppose my love of the musical Wicked makes me a little biased towards the green enchantress, but Oz: The Great and Powerful probably doesn’t follow the same story. The main focus of this adaptation is Oscar Diggs, a man who eventually becomes the Wizard, played by James Franco. It follows Digg’s journey from a dead beat magician in Kansas to the wonderful land of Oz. Along his own yellow brick road, Oscar meets three witches named Evanora, Theodora, and Glinda. While Glinda (Michelle Williams)is easy to figure out as the Good Witch of the North, it’s not immediately clear who featured in the poster. In the trailer (shown below) it looks like Rachel Weisz’s Evanora is certainly wearing the beautiful black gown with a high collar that screams evil witch, but she could be from the East (the one who has a house fall on her in The Wizard of Oz). But it is Mila Kunis’s Theodora that is also known as the Western Witch, despite the fact that she’s wearing a pretty red dress and appears to have pink skin. It’s hard to tell who is donning the green paint in the shadowy artwork, but whoever it is certainly looks great with that lush background of plant life and the creepy haunted stump. It looks like we’re going to have to wait to have our questions answered. Oz: the Great and Powerful looks like it’s going to be a really fun ride, and it’s set to come out March 8th, 2013. Back in the day, 1981 to be exact, Sam Raimi was an unknown young director who made a low-budget horror flick about demons coming to life and attacking a group of kids at a cabin. Fast forward a few years and you can see him directing big budget stuff like the Spider-Man movies with Tobey Maguire and Oz: The Great and Powerful (featured above). But he still hasn’t forgotten his roots, and has helped to write and produce the re-boot of his own film, Evil Dead, for the new year. The trailer was incredibly exciting (view it here) because it looks just delightfully gruesome and terror inducing. It’s definitely something I’m keeping an eye out for, because any new information that is released is sure to add to my excitement. 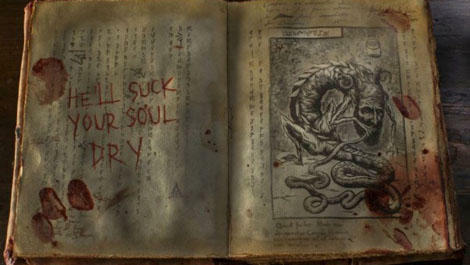 The latest photos show the Necronomicon, aka the Book of the Dead, a page turner made out of human flesh. It’s literature helps to bring out the monsters which possess the unwitting young people and turn them into murdering fiends. Getting a glimpse of this important artifact for the latest film is incredibly cool. The new version looks like an evil demon stitched it together by hand. Evil objects look so much better when they’re handmade, don’t you think? Martha Stewart/Satan would approve. 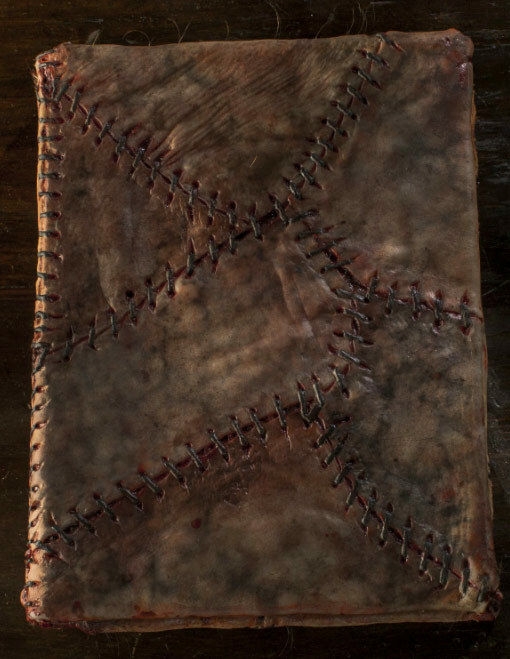 Evil Dead possesses theaters April 12, 2013 but here’s the bad so you can see it, and the monster currently haunting that page threatening to take your soul, for yourself. 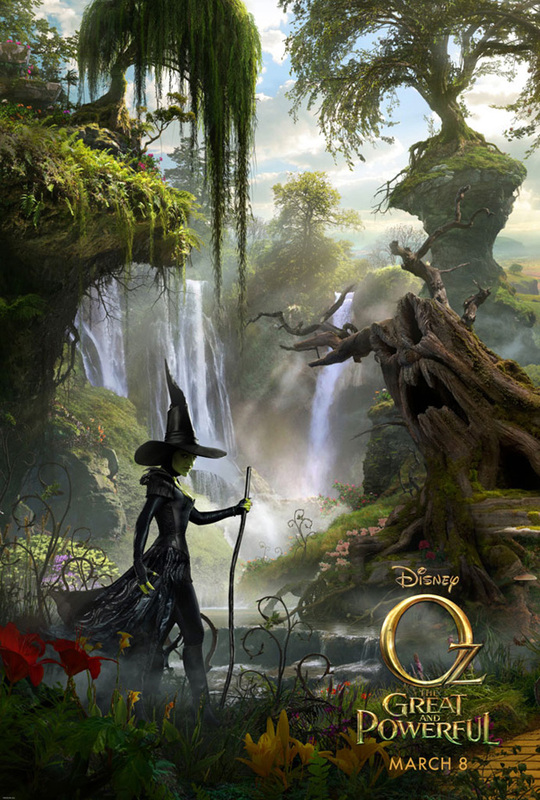 What do you think about the latest photos for Oz: The Great and Powerful and Evil Dead? Which one are you more excited to see in theaters? Comment below!